Thursday evening was the annual quiz night at the club. My team’s chance of winning was always remote and made even more so when we found that, in addition to the “professional” team who have no connection to the club who turn up every year to be booed as they receive their trophy from a couple of footballers they have never heard of, another team featured Shaun Wallace from the Chase. 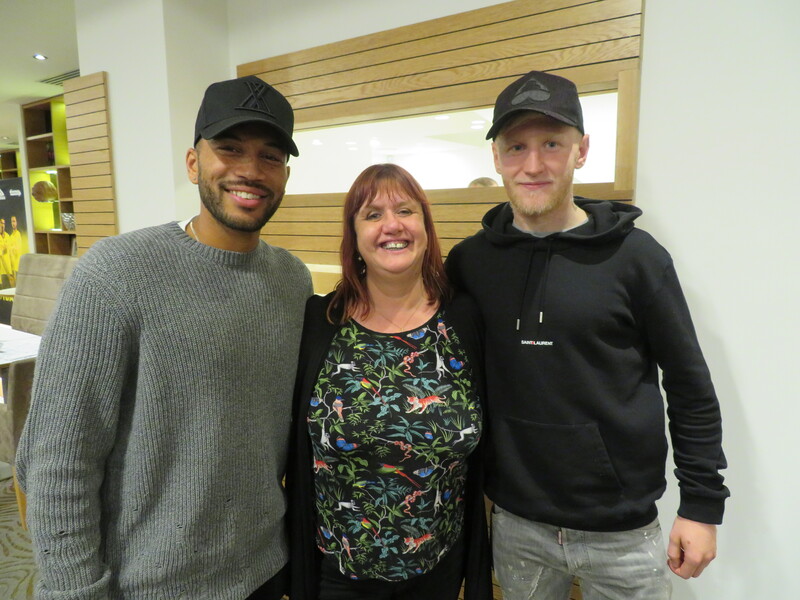 I consoled myself by congratulating Will Hughes on his wonderful performance against West Ham and having a long chat with Adrian Mariappa, who told us that Marco Silva reminds him of …. Sean Dyche. When I booked the train to Newcastle, I was rather surprised to see that the journey time was four hours. This meant an early start, so I found myself leaving King’s Cross just before 8am. The train was slightly delayed, so the pub was already open and surprisingly busy, when I arrived but, thankfully, the advance party had secured seats and we were soon joined by the Happy Valley Horns. There was also a special guest appearance from the lovely Katy, someone that I have “known” for years due to social media connections but have never met before. It was lovely finally to meet her in person. As it was her first live game of the season, I hoped that the lads would turn it on for her. For the walk to the ground, we took a slightly different route than usual, which took us around the city walls, just gorgeous. Every time that I visit Newcastle I am reminded what a beautiful city it is. The walk to St James’s Park is all uphill, but that is just the appetiser before the trek up to Level 7. As we climbed, there were posters warning about the dangers and penalties for pyrotechnics. One dire warning suggested that you could end up in A&E. I was concerned that the walk to the gods was more likely to send me there. Team news was that Femenía had recovered from his injury, so Silva named an unchanged side from the West Ham game. The starting line-up was Gomes; Mariappa, Kabasele, Britos; Femenía, Cleverley, Doucouré, Zeegelaar; Hughes, Richarlison; Gray. The home side had the first chance of the game as Murphy put a dangerous cross into the box, but the terrible miss-hit by Joselu was a sign of how their day would go. Watford’s first chance came from a corner, Hughes played it back across goal to Mariappa, whose overhead kick was blocked. 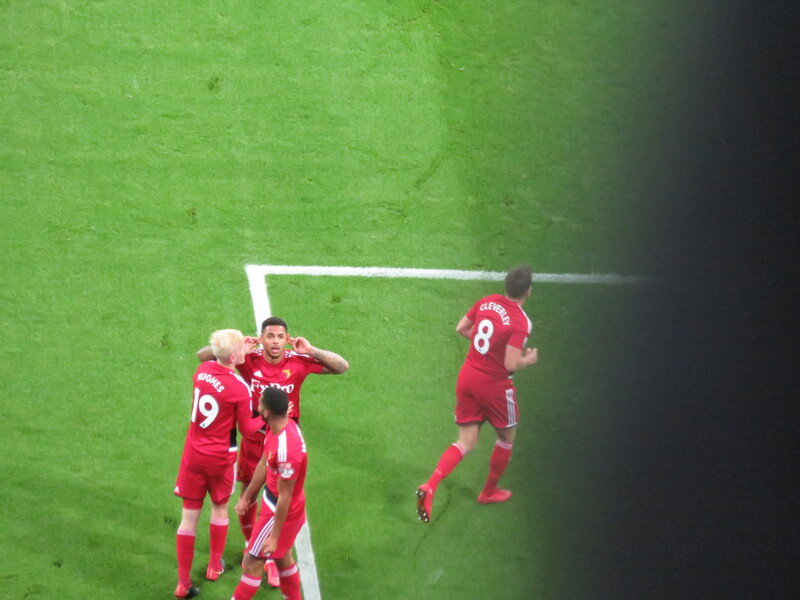 At the other end, Ritchie finished a run with a shot that was wide of the near post and into the side netting. Some lovely interplay from the visitors finished with a shot from distance from Hughes that cleared the bar. The youngster was in action in our box soon after, putting in a crucial tackle to prevent a shot, this allowed the Hornets to launch a counter attack that resulted in a through ball to Richarlison whose shot was tipped wide by Elliot. The first booking of the afternoon went to Shelvey for a tackle from behind on Britos. The Hornets took the lead on 19 minutes. Kabasele played a gorgeous cross-field ball to Zeegelaar, who crossed back for Hughes to fire past Elliot for his second goal in as many games. Watford should have scored a second soon after as Zeegelaar crossed again, this time for Doucouré, who turned the ball just wide. A dangerous looking break from Newcastle was stopped when Kabasele made a superb block to stop the shot from Joselu. The first caution for Watford came as Zeegelaar was cautioned for taking Ritchie down. The Hornets had a great chance to increase their lead on the half hour as a series of shots were blocked in the box, but nobody was able to test Elliot. Gomes was called into action just after the half hour as he came to punch a cross into the box. Then Joselu tried a shot from an angle that Gomes saved. The home side had a strong finish to the half, but Watford went in at the break two goals ahead as Zeegelaar broke and hit a cross that was turned into his own net by Yedlin. The travelling Hornets were all smiles at half-time. 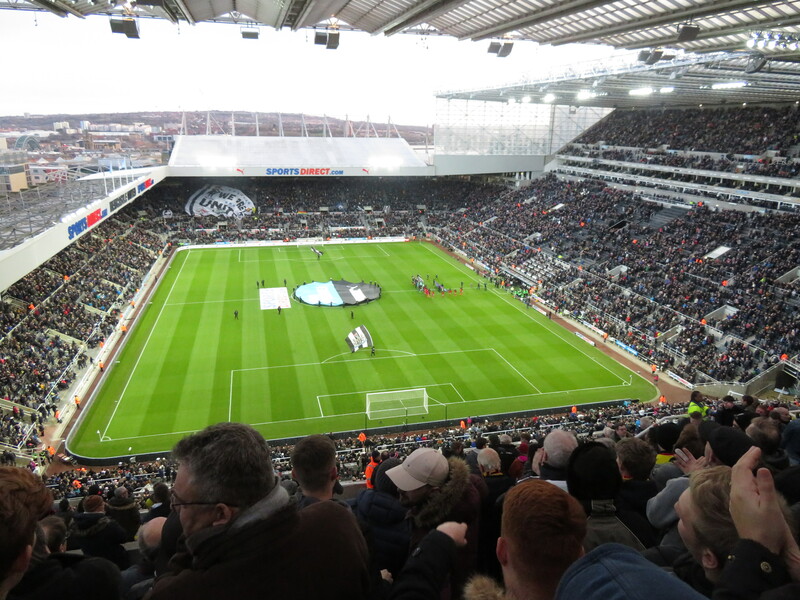 It had been an entertaining half of football and, after Newcastle had a decent late spell in the half, the second goal had calmed a lot of nerves and we felt confident of getting a result. Watford should have scored a third at the beginning of the second half as Gray went on a wonderful run into the box but, with the goal at his mercy, he managed to fire wide. He had a chance to redeem himself soon after, exchanging passes with Hughes before taking his chance, but the shot was blocked. The ball found its way to Richarlison on the edge of the area, but his shot flew wide. Watford’s first substitution saw Prödl coming on for Britos, who was limping. Another great chance went begging as Richarlison broke into the box and should have buried it, but hesitated before shooting, allowing the defender to get into position to make the block, the follow-up from Hughes was also blocked. There was a decent chance at the other end as Murphy met a cross from Yedlin, but the header was poor and flew wide of the target. Watford attacked yet again through Zeegelaar, who had the freedom of the left wing, he crossed for Gray but the header was over the bar. The former Burnley man got his goal just after the hour mark as Richarlison broke forward and crossed for Gray to poke it past Elliot from close range. Newcastle hadn’t given up and should have pulled one back as Joselu slid in to shoot, but Gomes got a hand to the ball to keep it out. Benitez made his first substitutions bringing Merino and Mitrovic on for Diame and Joselu. Mitrovic tried to make an early impression as he broke into the box but the shot was poor and Gomes was down to make an easy save. 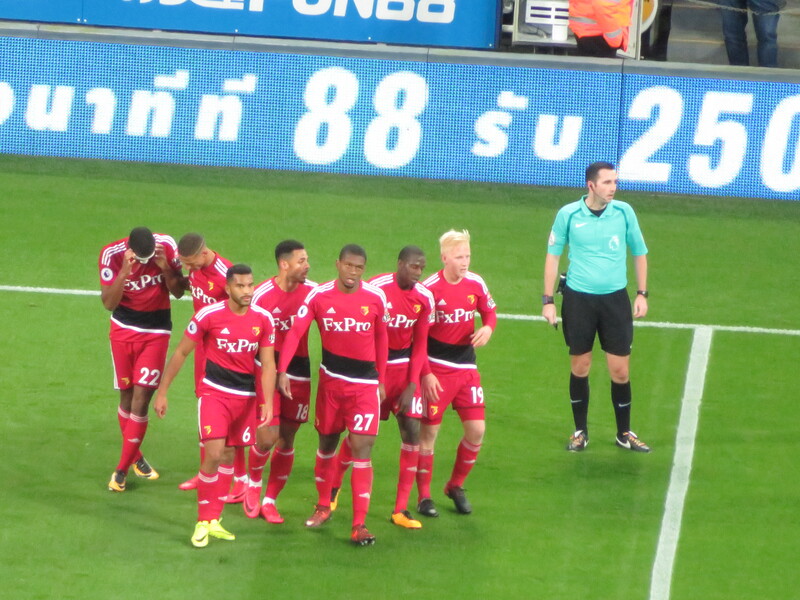 There was a change for each side with just over 10 minutes to go as Pérez replaced Murphy for the home side and Pereyra came on for Richarlison for the visitors. Pérez had a chance to pull one back for the Magpies, but his shot from just inside the box was over the bar. Gray could have made it four for the Hornets after he was released by Prödl, he had only the keeper to beat, but passed it into Elliot’s arms. Silva made a final change bringing Carrillo on for Hughes, who went off to a huge ovation from the fans up in the gods, which he acknowledged, so we knew the players could hear us. Newcastle had another attempt to spare their blushes, but Kabasele did brilliantly to block the shot from Mitrovic. Watford had one last chance to score a fourth, but their swift counter attack finished with Cleverley shooting over from distance. There was only time for Prödl to be booked for a robust (and unnecessary) tackle on Mitrovic and the final whistle went on a convincing win for the Hornets. To add insult to injury, the big screen was displaying the winning ticket in the Match day draw with a code that started with WFC. We were all smiles in the away stand. It had been a convincing win against a team that we have to consider to be rivals. There were some outstanding performances. Will Hughes impressed again, as did Zeegelaar and Kabasele. As I waited at the station for the train home, Miles Jacobson appeared and kindly kept me company for the journey home. Our first encounter was with a disappointed Newcastle fan who observed, “You had a good day, bonny lass.” I have always loved Geordies. Then our neighbours on the train were a father and son, who I recognised from away trips, who were having a joint birthday celebration. My comment that we had been fantastic was met with some scepticism and a discussion of the negatives from the performance, which gave me pause for thought. It is true that Gray looks like he lacks a bit of confidence, he was terribly wasteful in front of goal and really should have had a hat-trick, but he still managed to get on the scoresheet. Richarlison didn’t have the best of games, but he provided an assist and the attention that the Newcastle defence paid to him certainly contributed to Zeegelaar having a tremendous amount of space to play in to provide the assists for the other goals. Despite the concerns, we all agreed that being able to win convincingly when not at our best has to be a good thing. The icing on the cake was the news (first heard from Don Fraser) that one of the supporters’ coaches had broken down in the Derby area on the way to the game and the fans had been transported to Newcastle in taxis at the club’s expense. Well done to Watford for that. It is good to see that for our club, the fans matter after all. These really are the good old days. This entry was posted in Watford FC and tagged Abdoulaye Doucoure, Adrian Mariappa, Aleksandar Mitrovic, Andre Carrillo, Andre Gray, Ayoze Perez, Christian Kabasele, Ciaran Clark, Deandre Yedlin, Dwight Gayle, Florian Lejeune, Heurelho Gomes, Jacob Murphy, Javier Manquillo, Jonjo Shelvey, Joselu, Kiko Femenia, Marco Silva, Marvin Zeegelaar, Matt Ritchie, Miguel Britos, Mikel Merino, Mohamed Diame, Newcastle United FC, Rafa Benitez, Richarlison, Rob Elliot, Roberto Pereyra, Sebastian Prodl, Tom Cleverley, Watford FC, Will Hughes on November 26, 2017 by franelynn. Yes Frances, these really are The Good Old Days. Thing is, they’ve been going on for a good many seasons now. Our Good Old Days have lasted longer (for us) than most clubs fans get to enjoy.